Build muscle strength fast / 14 weights training tips to follow! In order to build muscle strength fast, we have to lift weights. Strength training, also known as resistance training is the only way to make your muscles bigger and stronger. It is the process of pushing or pulling a resisted weight through a certain range of motion using dumb bells, exercise bands and bodyweight. For beginners, always start with basic body weight exercises or machine weights. 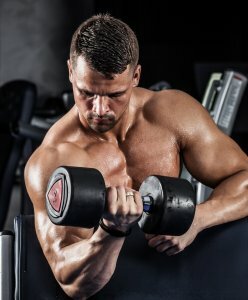 Proceed on to free weights after you gain some strength with sound techniques. Repetitive force exertion leads to muscle breakdown and repair process. It builds larger and stronger muscle fibres each time it repairs itself. This type of training increases muscle mass and bone density. Helps to maintain functional strength you need for daily activities such as walking, running, carrying groceries and climbing stairs. According to training guidelines from ACSM (American College of Sports Medicine), it is important to work all major muscle groups (chest, back, abdominal, legs and shoulders) at least twice a week. Work each muscle group up to 3-5 sets with 8-12 repetitions each. Short rest of 30-60 seconds between sets to allow recovery. After each session, your body needs at least 48 hours to recover. Protein synthesis will occur during this resting process. 14 effective strength workout tips. Warm up and cool down properly for at least 5min each. Treadmill walking, slow jog, jogging on the spot or some jumping jacks are some good examples. The idea is to increase body temperature and regulate blood flow to various muscles. Do not rush through your reps. Always focus slow and controlled weights lifting. Get a good tempo without using momentum from your body. Avoid jerking and abrupt movements. Focus on the correct form and not how heavy you can lift. You are not participating in an Olympic lifting competition. You are building your body. Execute full range of motion. Many gym goers do small little repetitions which are not effective at all. Optimise the gains by moving through a good range of movement. Concentrate on lowering action. A good and slow eccentric movement allows more muscle breakdown. Remember to breath properly. Try not to hold your breath for too long (Valsalva Maneuver). Inhale and exhale in a steady rhythm without gasping for air. Fast and shallow breathing reduces oxygen uptake, affecting performance. Exhale during exertion and inhale during relaxation or release. Constantly challenge yourself by increasing resistance gradually. Avoid jumping to heavy weights training too fast. Being impatient leads to injuries. Strength gains don’t happen overnight. Increase the intensity of the weight only if you are confident with good form and technique. Choose the correct weight for muscle hypertrophy. Use the right weight that allows you to perform 10-12 reps, feeling super sore by the last 2 reps. Lower the reps for building strength (do fewer reps if you want to lift heavy). Do more compound exercises instead of single joint ones. Compound exercise involves 2 or more joint movements. A few good examples are bench press, push ups, pull ups, squats and lunges. These target big muscle groups. Single joint exercises such as bicep curls doesn’t burn as much. Work your legs. It is proven that working the lower body increases your testosterone levels which enhances your growth. Get a fixed routine. Work each muscle group at least twice a week for optimum results. Stick to it for at least 2-3 months. Get more sleep. Muscles don’t grow in the gym. Growth only happens when you are resting during sleep. Take a few days break from training if you are plateauing. Return again after feeling fresh and motivated. Even machines needs a break! By doing so, it reduces the chances of overtraining or de-training. Do foam rolling or go for a sports massage to rejuvenate your body. Joints and muscles get stiff easily.